Aweekly half-an-hour slot on BTV was all he had and in doing so he has changed the country's agricultural scenario for ever. There are few who haven't heard his name and fewer who haven't seen him in his discernable green half-shirt standing in the middle of a crop field, sporting an unassuming sun hat. For 16 long years from 1980 to 1996 he appeared on the screen every Friday at 8.30 pm and in some 582 episodes he almost literally laid the path the country's agriculture would be following. The programme was Mati O Manush (MOM) and the man Shykh Seraj. He was not an ingenious agriculture scientist who made extraordinary discoveries. But he was a man of vision who had the tenacity to turn that vision into reality, something that has made this man a hero among the farmers of Bangladesh. 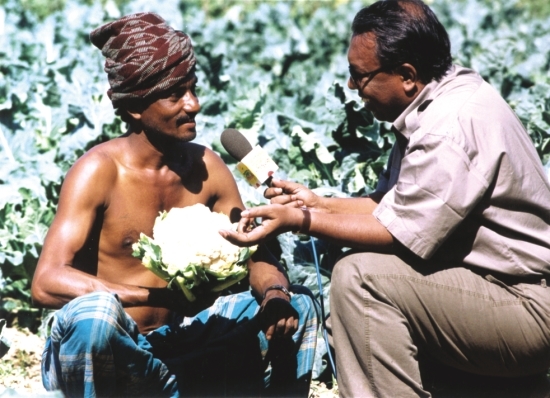 With his informal style of interviewing and a charming demeanour that put even the most shy farmer at ease.